The Love American Style TV show was a anthology comedy series on ABC with between one and five short stories per night about love and how people deal with their emotional relationships. The combination of serious emotional issues and a healthy sense of humor is what made this series unique and a classic. Written By: "Charles Fox & Arnold Margolin"
Performed By (First Season): "The Cowsills"
Performed By (Seasons 2-5): "The Charles Fox Singers"
Truer than the Red, White and Blue. And on a star spangled night my love, (My love come to me). In an unusual turn of events Love American Style ran for 60 minutes per episode for its first season, 30 minutes for the first 15 episodes of the second season, and then back to 60 minutes for the rest of its run! Oscar Mayer was the main sponsor for Love American Style. Do you remember those commercials; "My bolonie (sic) has a first name. It's O S C A R! ..."
Love American Style segment characters went on to have their own TV series. The best known "spinoff" was "Happy Days" whose main characters appeared for the first time on the segment "Love and Happy Days" which aired on February 25, 1972. Another was "Barefoot in the Park", inspired by "Love and the Good Deal" on November 24, 1969. The third was "Wait 'till Your Father Gets Home", inspired by "Love and the Old Fashioned Father" on February 11, 1972. We might also give some credit to Love American Style for the Happy Days' spinoff series "Joanie Loves Chachi", "Laverne and Shirley", "Mork and Mindy" and "Out of the Blue"! There was also a short-lived remake in 1985 titled, "The New Love American Style". The series ran for years in syndication. The fact that the series was composed of over 300 segments of varying length made it easy to edit the best segments together into half hour broadcasts. 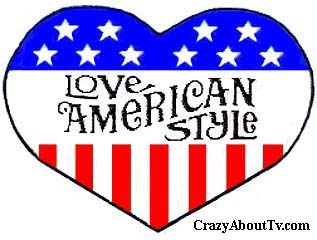 Love American Style's catchy theme song received Emmy nominations four years in a row (1970-1973). It won the Emmy in 1970 and 1973! The series was also nominated for the "Outstanding Comedy Series" in both 1970 and 1971 but lost to "My World and Welcome to It" in 1970 and "All in the Family" in 1971. The series also got a Golden Globe nomination in 1970 for "Best Musical/Comedy TV Show" but lost that one to "The Governor and J.J.". During the third and fourth seasons of Love American Style ABC had a Friday night comedy lineup that many critics agree was the best in television history! The evening began with "The Brady Bunch" followed by "The Partridge Family", "Room 222", "The Odd Couple" and Love American Style! In some ways it's surprising that Love American Style didn't remain on the air longer. Just a few seasons after it ended a show with a very similar theme premiered and ran for a whopping nine seasons! Of course, everyone has heard of the hit series, "The Love Boat" which also was composed of multiple love stories mixed with comedy on each of its episodes. Both series also guest-starred numerous popular stars from other TV series which added greatly to the appeal of the episodes. This technique has been used in more recent comedy series and typically raises the rating of all series involved but the interchange of characters is typically limited to a few from only two series. One more recent example is the appearance of characters from "The King of Queens" and "Everybody Loves Raymond" on each other's shows. On an episode of Love American Style or The Love Boat you might see three or more characters from other series in one night and then totally different ones the following week! Thank you for visiting our Love American Style page!